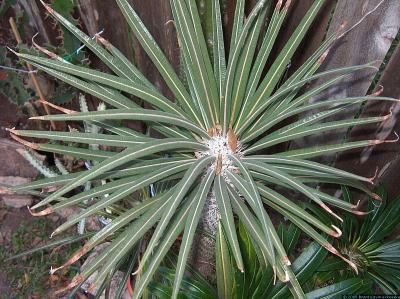 The Madagascar palm is an easy plant to grow. It likes full sun, along with water and food during the warmer months. If it doesn't get water during the summer, it will just drop its leaves and wait for you; when the watering resumes, new leaves will come out. I quit watering mine in October or so that it will harden off before our first possible freeze in December. 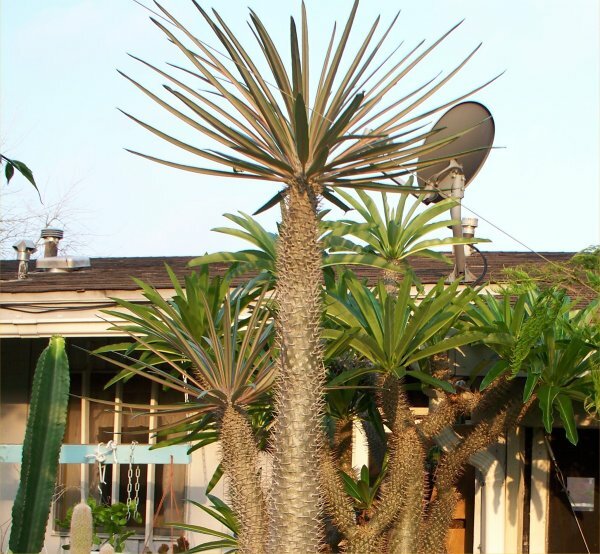 Pachypodium can take a light freeze with no damage. A slightly harder freeze will kill off the top, which causes the plant to branch out from there next spring. Even harder freezes will kill back the whole plant, but if you've insulated the base at all, it should grow back eventually. The definition of 'harder freeze' depends on exposure to prevailing winds, mulch, duration, etc. For me, in Fahrenheit: light freeze = 30-32 degrees; slightly harder: 29-30 degrees; even harder: 25-28 and less degrees. Less than 25 degrees in south Texas = panic. Pachypodium gaeii seems to be slightly more cold tolerant than others of its genus.